The UK Public Health Entomology Lab reported the first capture of Asian tiger mosquitoes last week in central Kentucky. This is about 2 weeks earlier than normal. Peak numbers of this common nuisance mosquito usually occur during late July and early August. Female Aedes mosquitoes glue their eggs above the water line in artificial containers (such as tin cans, old tires, etc.) or in tree holes that hold water. These eggs hatch after they are covered by collected rainwater. Mosquito larvae (wrigglers) feed on microorganisms in the water and grow rapidly in warm weather. Larvae must regularly approach the water surface to breathe through a distinctive tube that extends from the end of their body. Full-grown larvae become pupae, often called “tumblers” because of the way they move. The pupae also must go to the surface to breathe. Development is directly associated with temperature. The mosquito’s life cycle from egg to adult requires approximately 1 month at about 50oF but only 10 days at 90oF. The life cycle is depicted in Figure 2. Figure 2. 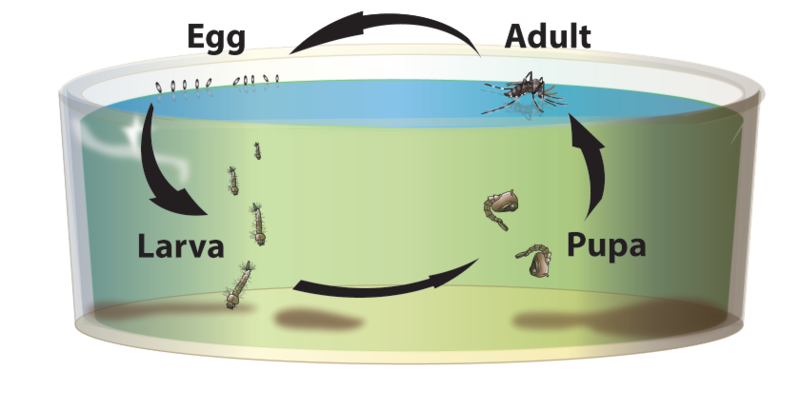 Life cycle of the tiger mosquito from egg to adult. After emerging as adults, males and females feed on nectar until ready to mate. A mated female must have a blood meal before she can lay a batch containing 40 to 90 eggs. Females live 2 to 3 weeks, feeding and laying egg masses at weekly intervals until death. Asian tiger mosquitoes are not strong fliers. They normally remain within about 200 yards of their breeding sites. The species is an aggressive biter that feeds during the day. They are most active in early morning and late afternoon. It is an opportunistic feeder that predominately feeds on mammals. Humans, dogs, and cats are the main hosts in urban settings. In rural areas, they also will feed on livestock and wildlife. 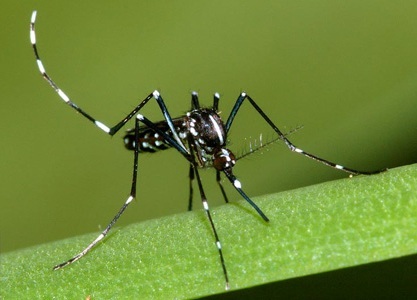 These mosquitoes prefer to feed on lower legs, especially the ankles, when attacking humans. They also will bite around the head, neck, and arms. ‹ “Bug-Zappers” For Backyard Mosquito Control?